I'm kicking off the start of a brand new week with Xyron and Clearsnap today. 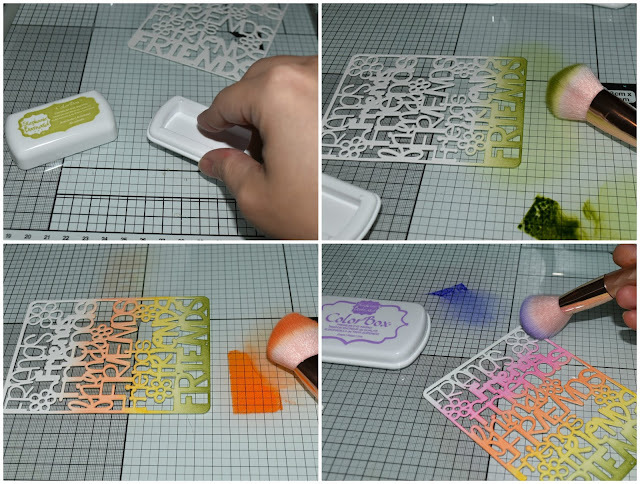 And I've got a quick and easy technique to share with you that is sure to make your crafting world a whole lot brighter! Background dies have been gaining popularity. These dies make card making a breeze and with some plain white paper and a few inks you can customize your cardstock with fun results! 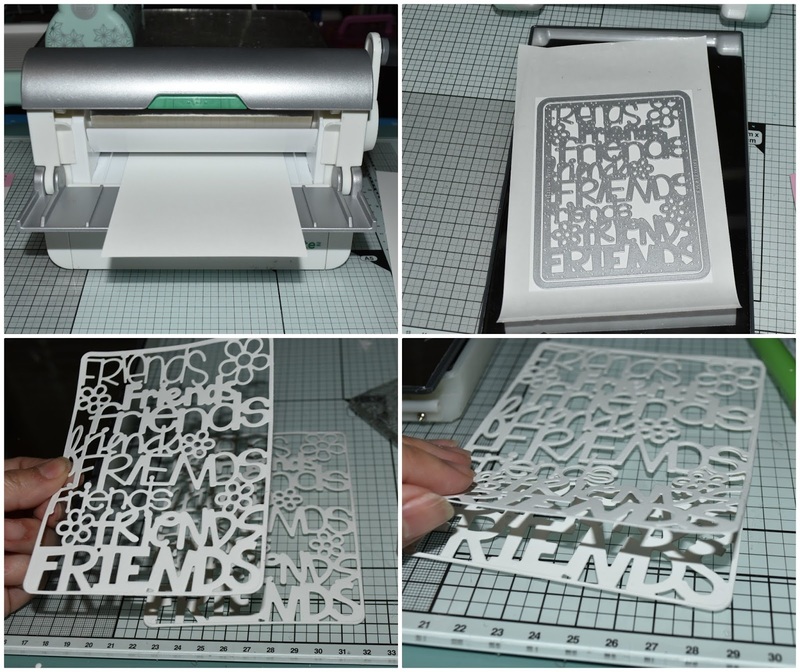 I started by running pieces of 4.25" x 5.5" white cardstock through my Xyron Creative Station Lite. I die cut the piece using my Stephanie Bernard Friends Dies twice. Then layered them together. I pressed some color from my Stephanie Bernard ColorBox Premium Dye Ink Pads onto my work surface. Then used a make-up brush to apply color onto my die cut. I put a strip of each color down one at a time making each strip about an inch wide, starting dark at the bottom and blending the color light at the top. I repeated this step for each color. Starting with Kiwi, then Lemonade, then Tangerine, next Candy, then lastly, Grape. I overlapped each color to blend where they meet instead of having a harsh line. I used the solid background die to die cut a backing for my "worded" background. I applied brads to the die cut flowers in the background. 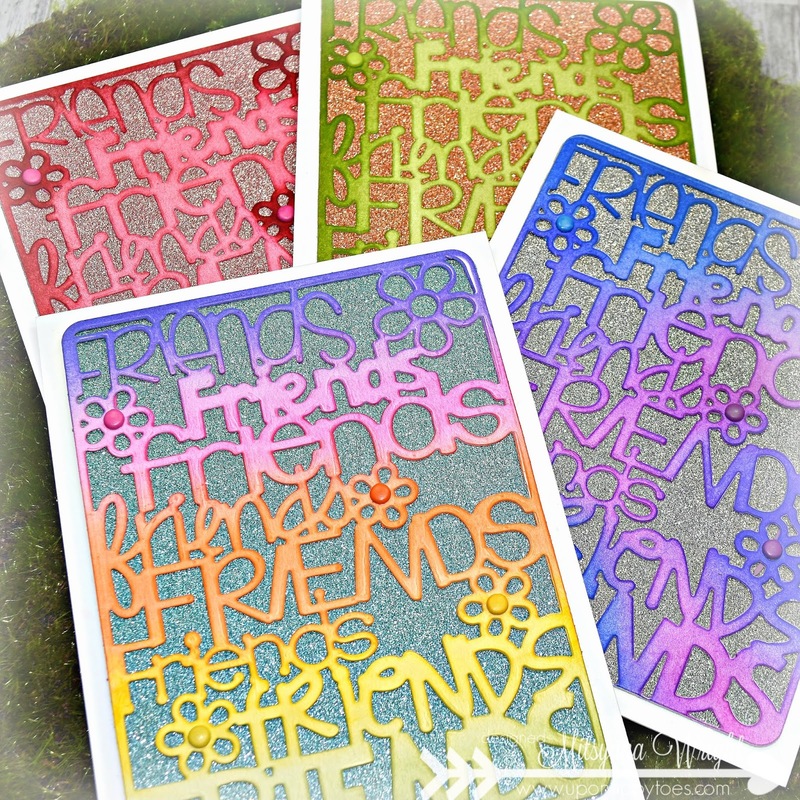 then peeled the adhesive backer and applied my color die cut onto my glitzy/ glittery cardstock. Then burnished it for maximum adhesion. Then, I used my Xyron Mega Runner to apply the card front onto a standard A2 (4.25" x 5.5"- folded) card made from white cardstock. Look how stinkin' cute this is!! I tapped down more color onto my mat and decided to do a triad of colors. And instead of putting them in any sort of order I decided to just go nuts a brush on bursts of color here and there... going laying them down totally at random. This time, I laid it on dark around the perimeter, then dragging and blending in the color in lightly. a good makeup brush will blend out softly and look like your color was airbrushed on. 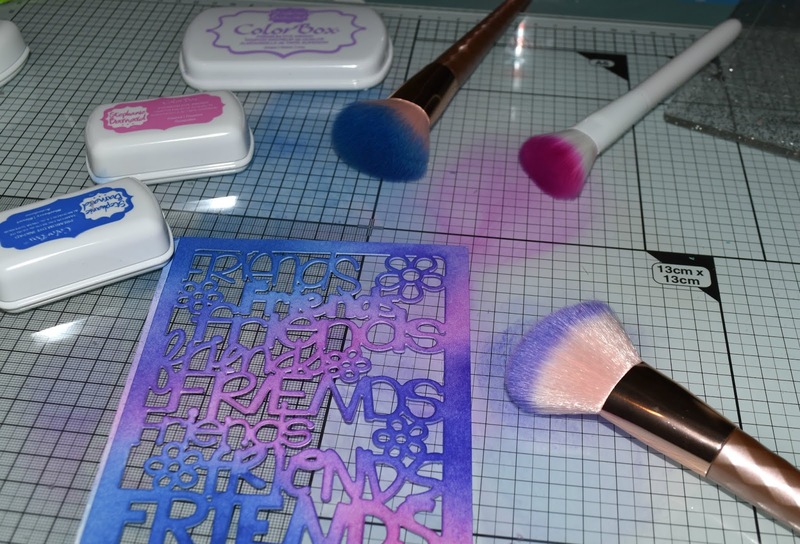 My rule of thumb is... if it can blend on your makeup beautifully, then it'll blend on paper just as beautifully! For this last sample, again I started dark around the edges but lightened my blending and I went in towards the center. The only difference, I also darkened all the flowers. 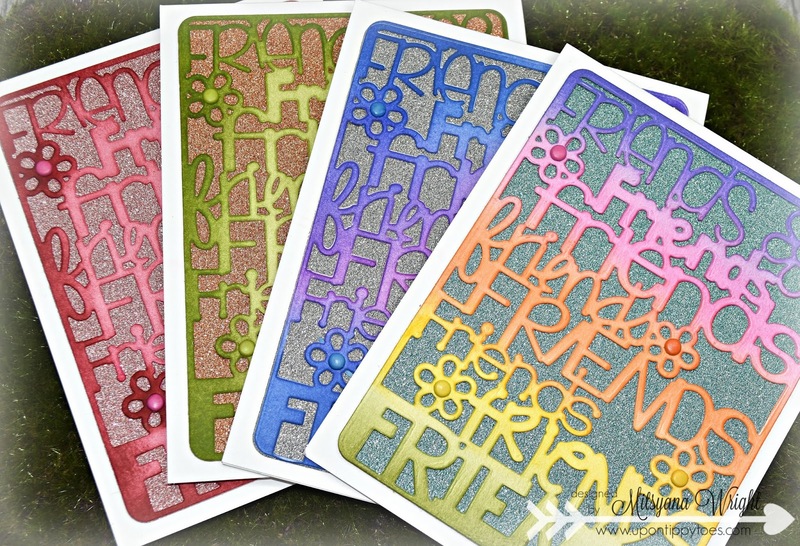 These are just crazy easy and the glitzy cardstock gives them a touch of glamour! The bling really makes all the colors just pop even more! I love how they all turned out! and I love how smoothly the colors blended! I can't wait to make more! Hope you liked today's quick project and it inspires you to give it a try!